The last Tuesday of every month we ring the bells at Blisland Church. On Sunday Cathy brightly announced ‘Blisland on Tuesday’. “No, it can’t be,” I cried, “it’s not the end of September yet!” Unfortunately I was wrong and last night one of our members drove to St Breward thinking the same. Where has September gone? After a really wonderful summer September gave us a boost with more sunny warm days making it feel like this beautiful weather could go on forever. The longer the sun shines the shorter winter becomes and everyone feels lighter and happier. 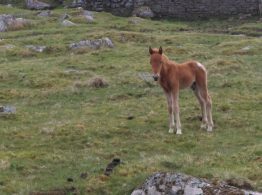 We’ve just enjoyed a stroll on Bodmin moor surrounded by cattle and their young calves and horses, some with their foals while many are still heavily pregnant – I reckon this weather could go on for a few more weeks if natures anything to go by! 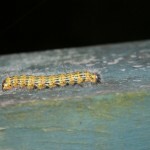 A caterpillar precariously slithering along the balcony – 15ft from the ground!! 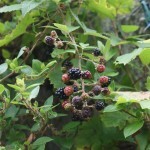 We’ve enjoyed a good crop of blackcurrants this year, the last couple of mornings I’ve wandered into the garden to collect a few for my breakfast – a very satisfying feeling and we’ve enjoyed a few crumbles too. 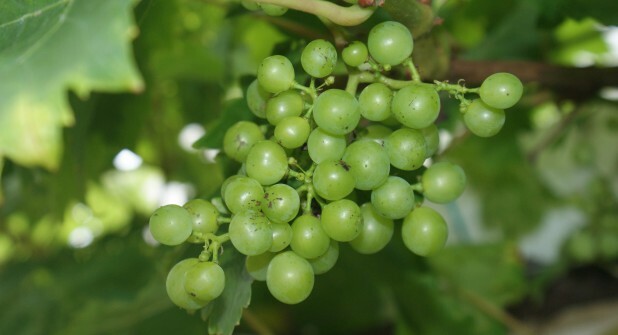 The grapevine has also produced a small crop – I’m not sure how many bottles we’ll make! The Oak, Hazel, Beech and Cherry trees are still looking very green although the tips of the Willow and Ash are showing signs of Autumn as they gently turn yellow. We don’t usually lose our leaves completely until early December so a long way to go yet. 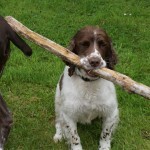 Pebbles, our old Springer has had a difficult time of late contracting infections and the loss of his friend Mars Bar hasn’t helped. He misses canine company as was confirmed when he disappeared recently. I found him with guests from the Stables playing and their dogs under the Beech trees. They couldn’t believe the vet had suggested putting him down. He certainly seems to have rallied and is now enjoying a jolly old life. We are getting a new puppy in a couple of weeks, a little Cocker Spaniel called Frodo. We are all very excited and hope this will boost Pebbles for a long time to come. We’re saving the newspapers and preparing for sleepless nights. I’ve been warned by Judith, a new puppy owner in the village. Don’t forget we’re open all year so if you fancy an Autumn or Winter break Darrynane is always here and welcoming.